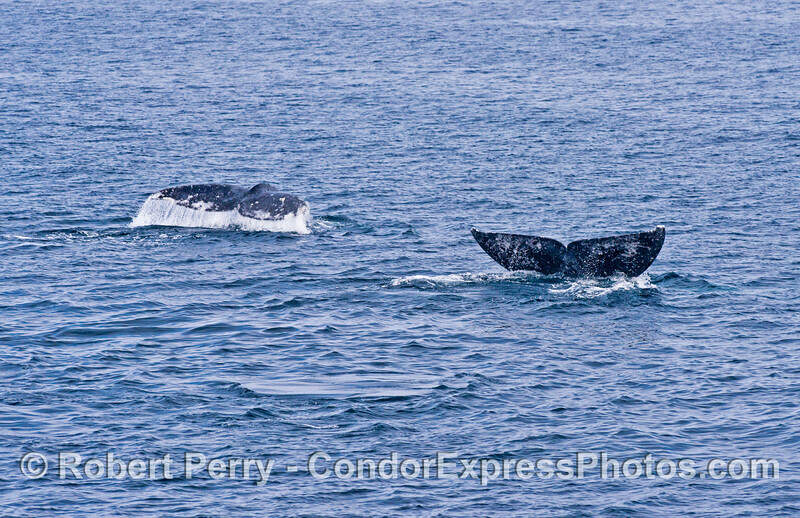 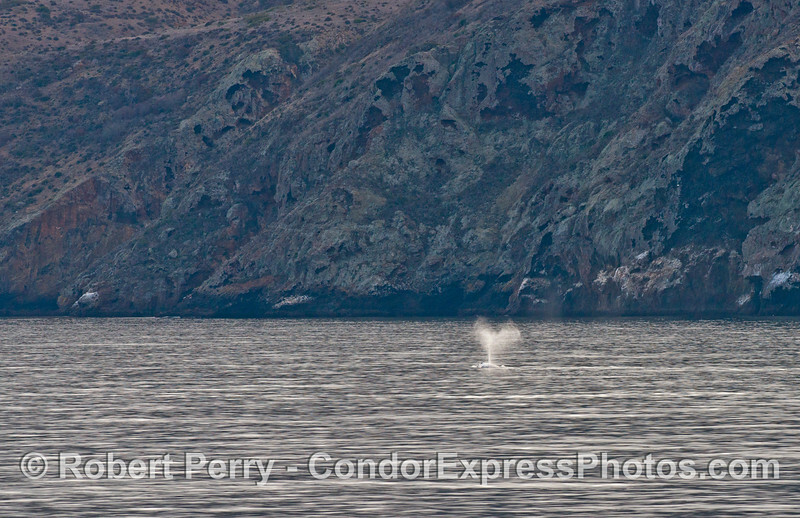 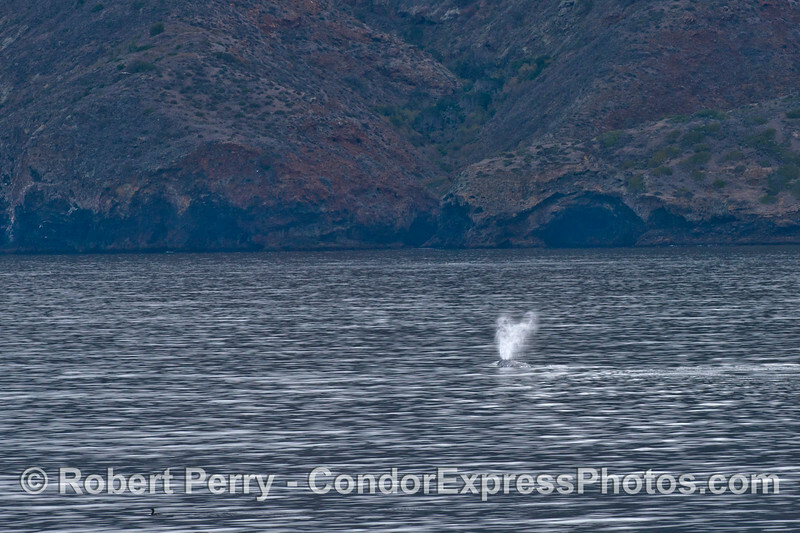 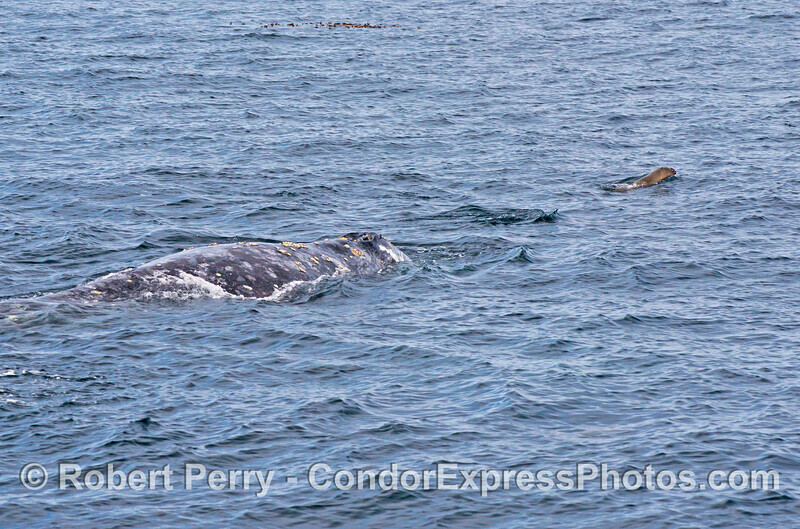 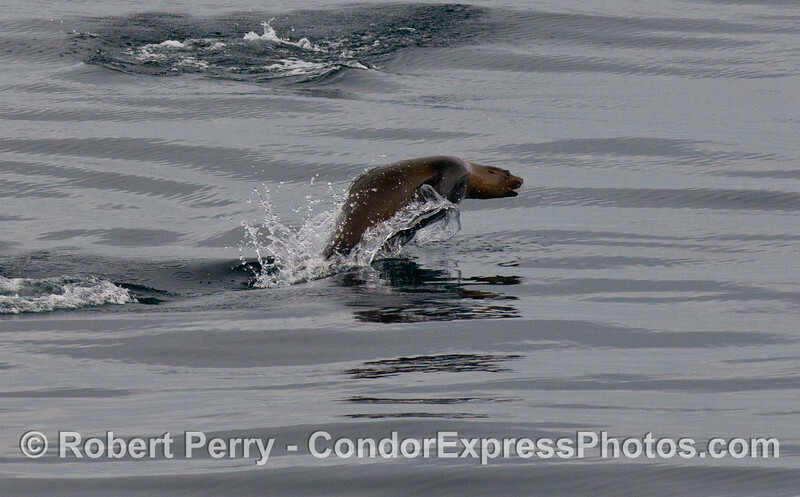 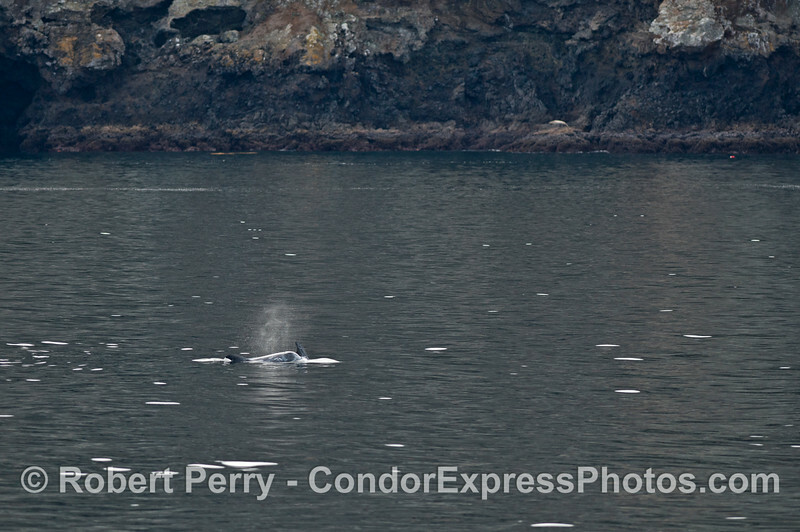 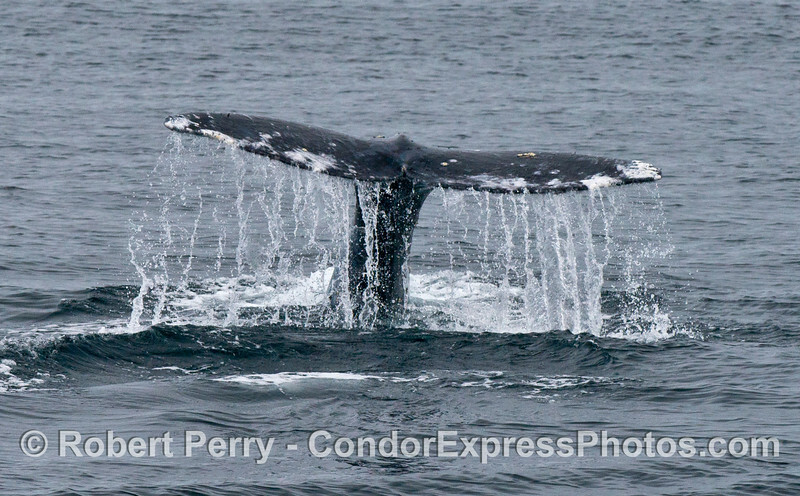 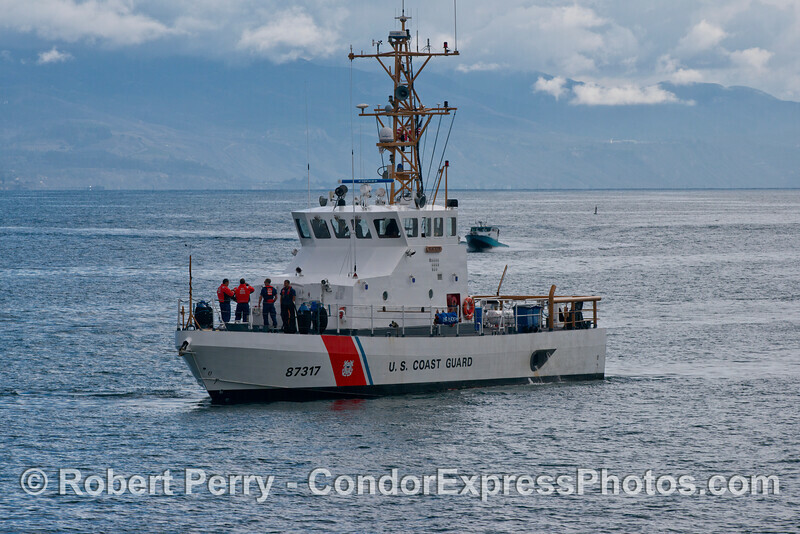 Gray whales, bottlenose and Risso’s dolphins, Dall’s porpoise and sea lions! 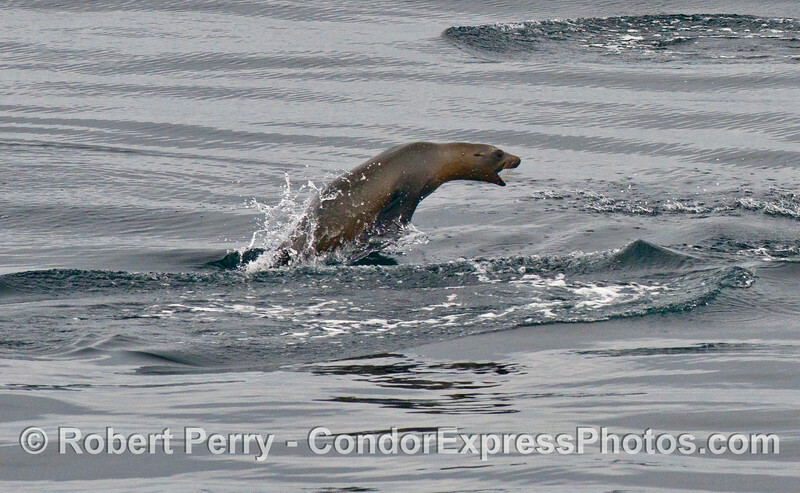 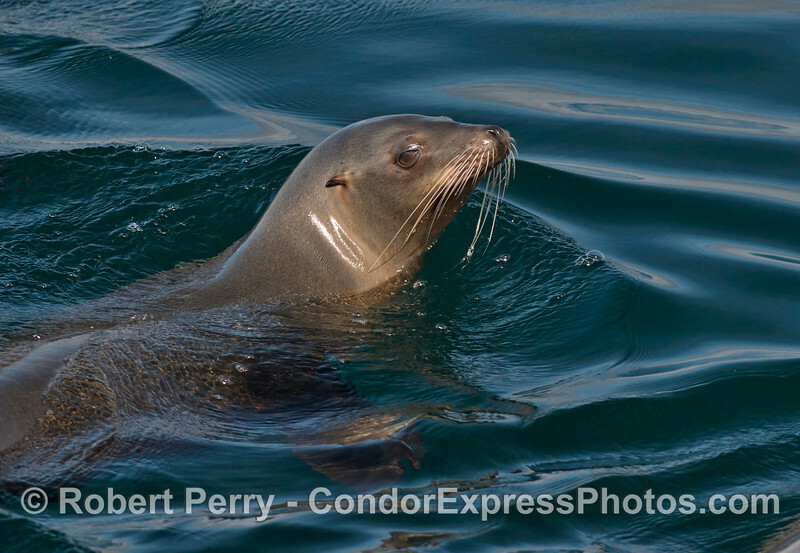 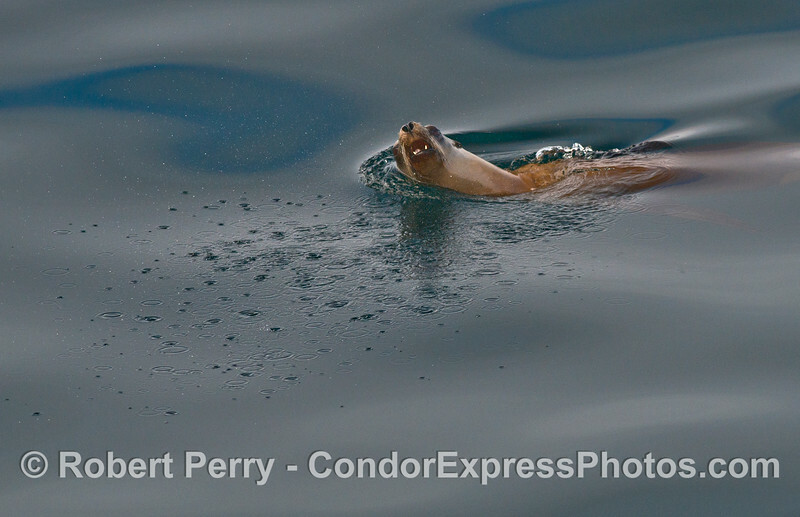 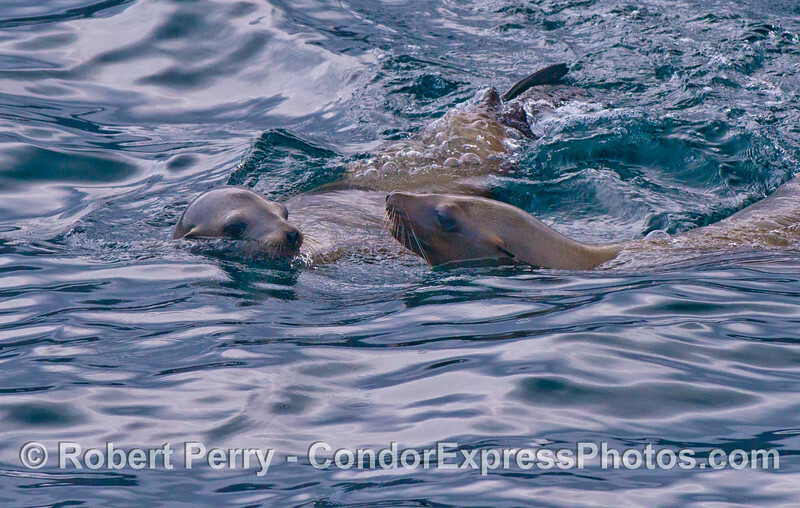 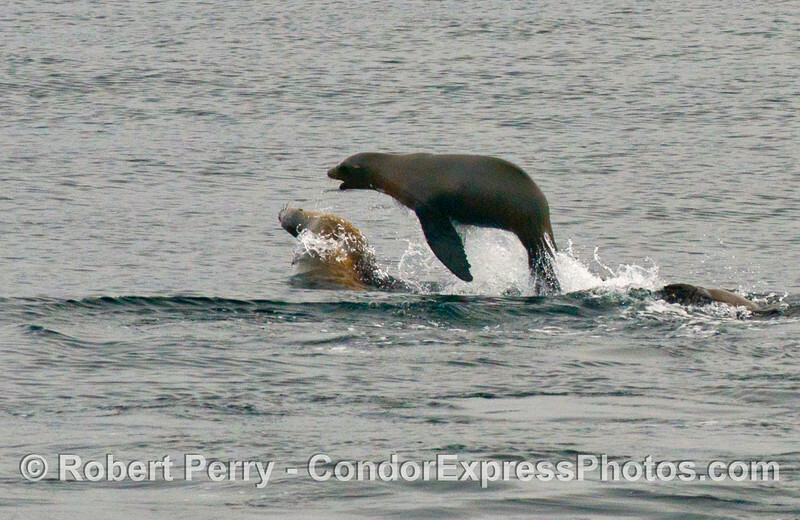 It was definitely a “who’s who” among the marine mammals in the Santa Barbara Channel today. 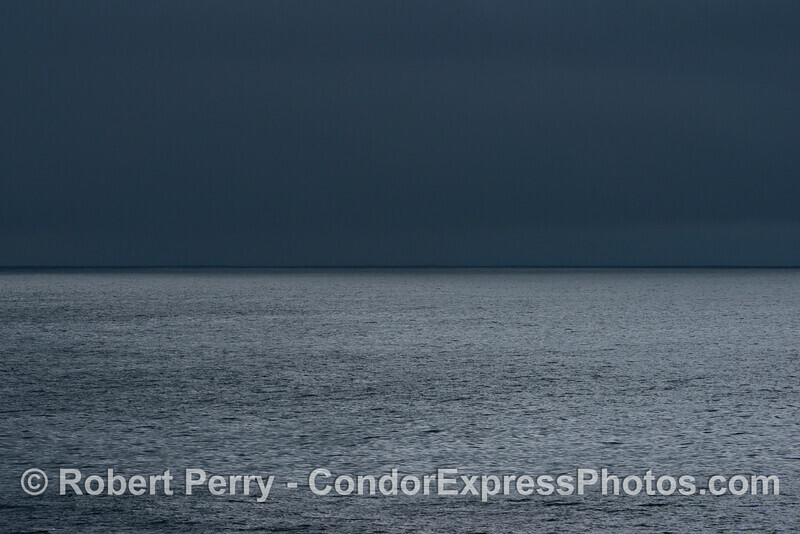 It was a grey, silvery day that started out with a light chop and some misty drizzle. 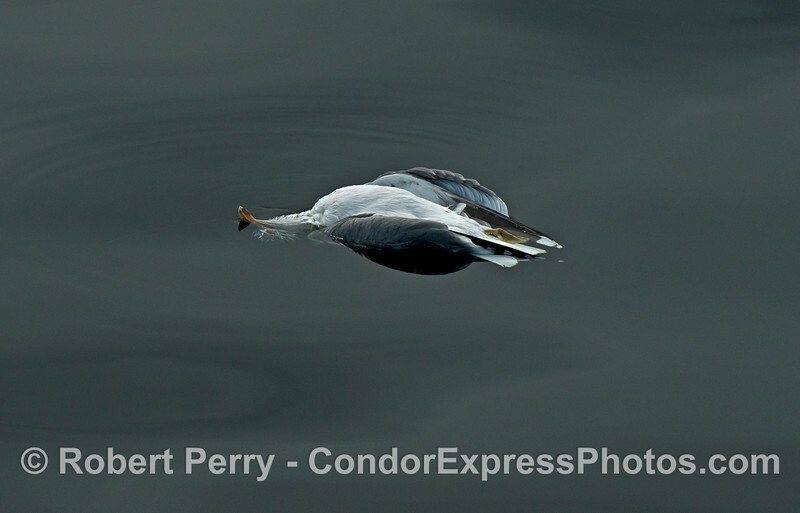 Things quickly improved to become a grey, silvery day with mirror glass conditions and no rain at all. 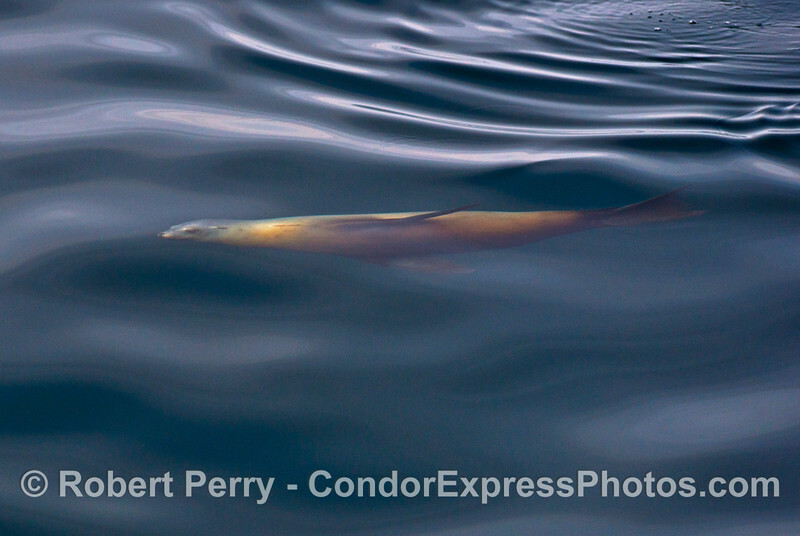 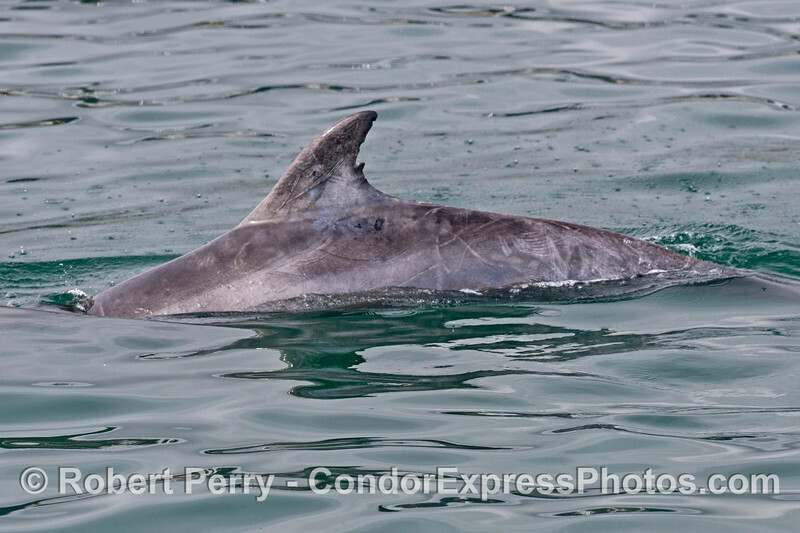 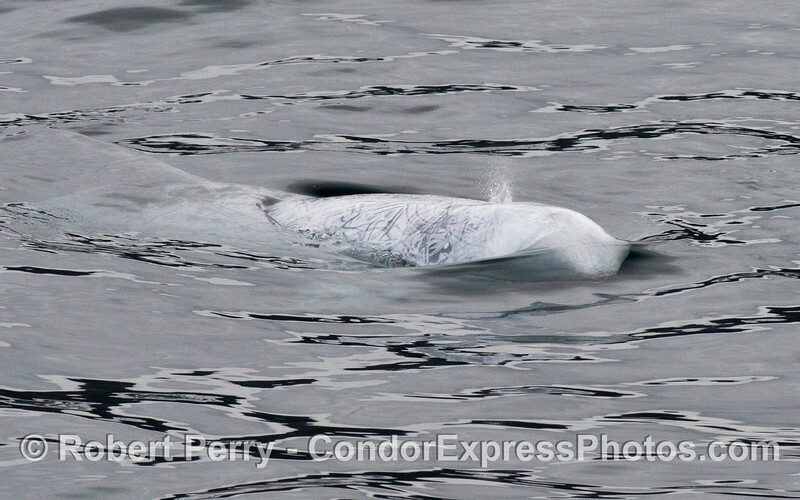 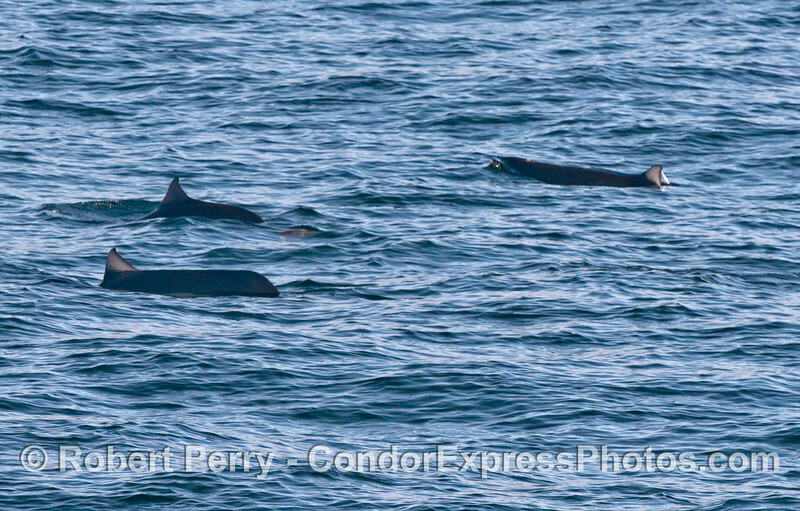 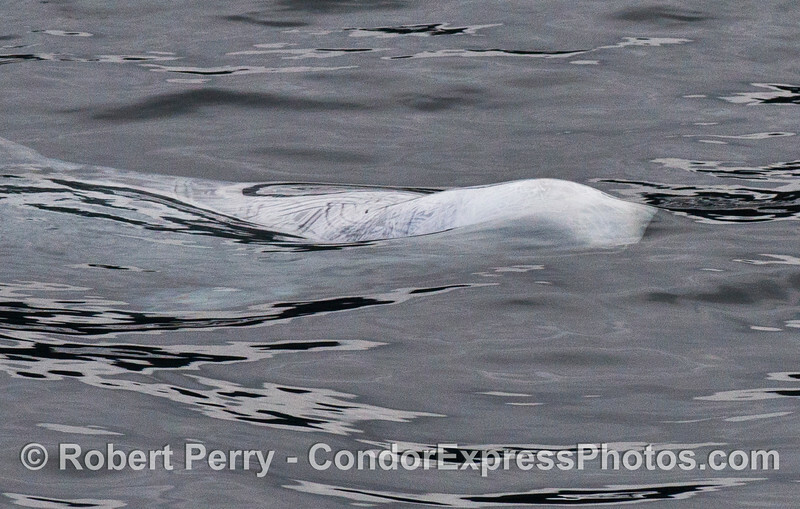 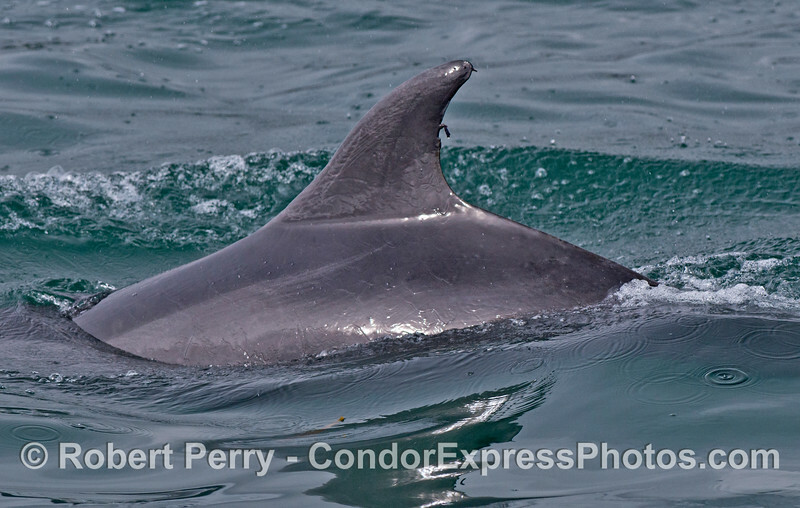 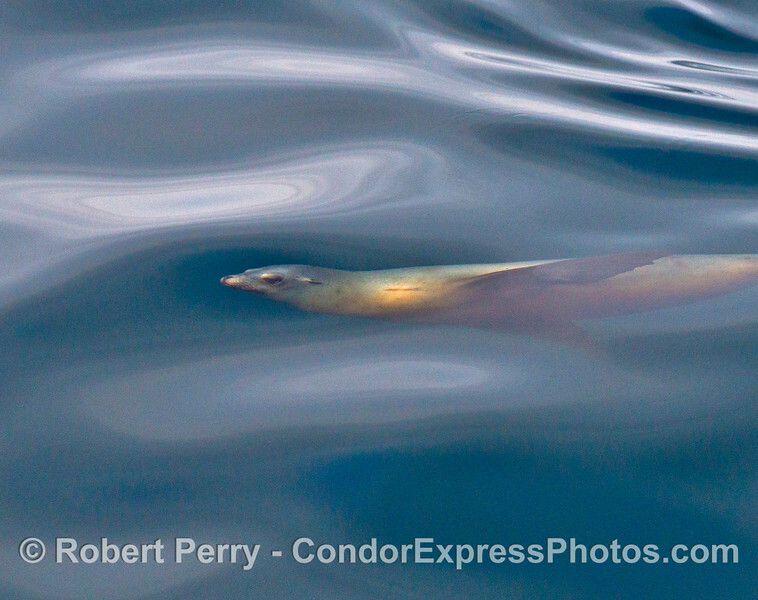 Just past mid Channel we came across a rather docile pod of 8 or 10 Dall’s porpoise. 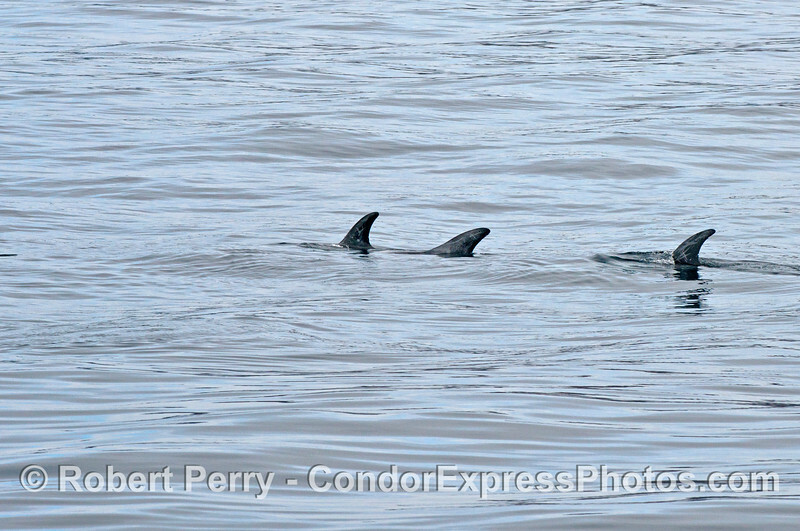 There was no racing, and no rooster tails, just a pack of the small porpoises feeding somewhere “down there,” and then popping up to the surface together. 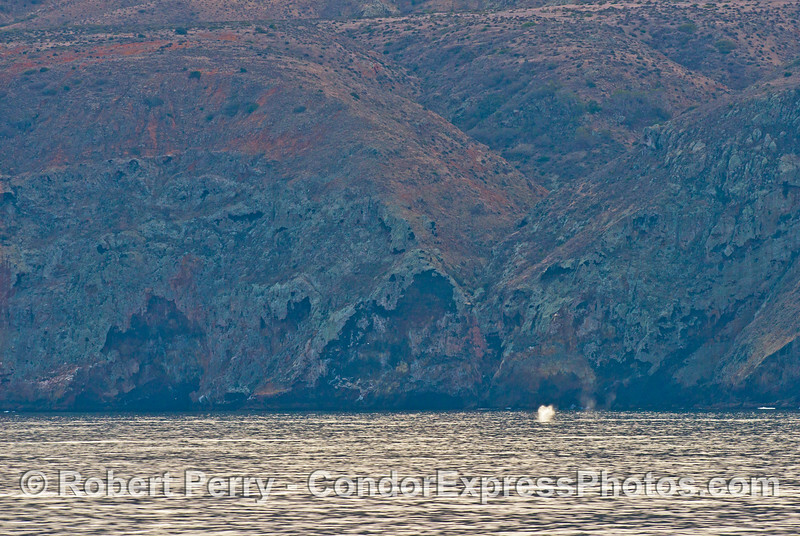 The 6 gray whales we watched were all observed close to the sea cliffs of northern Santa Cruz Island where their bushy early Valentine’s Day heart shape was clearly contrasted against the dark volcanic island. 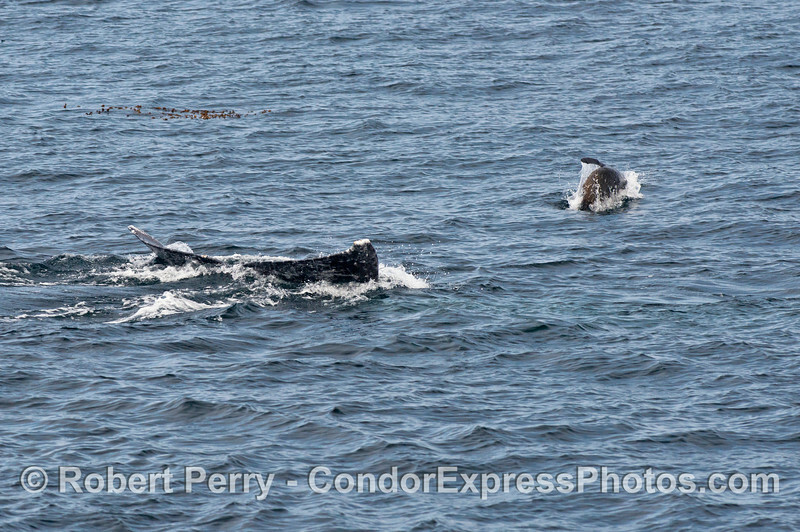 Among the gray whale sightings, the last encounter featured some great interaction between 4 whales and a pack of feisty young California sea lions. 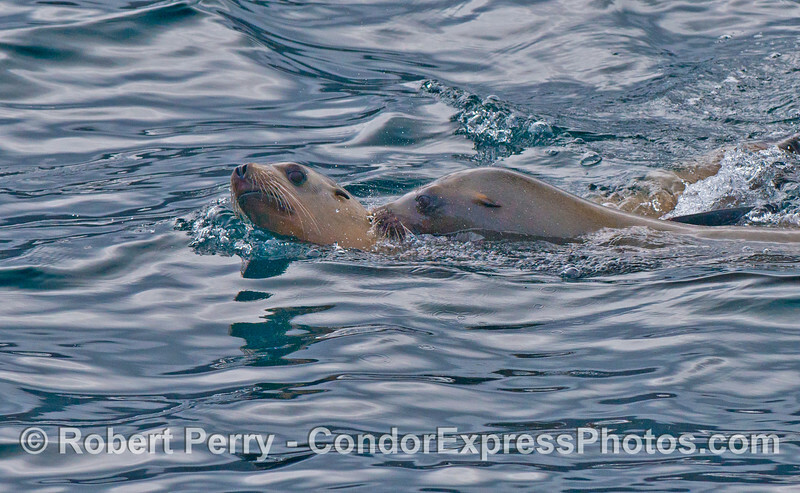 The sea lions marked the progress of the submerged whales and so it was easier than usual to keep alongside and the proper viewing distance. 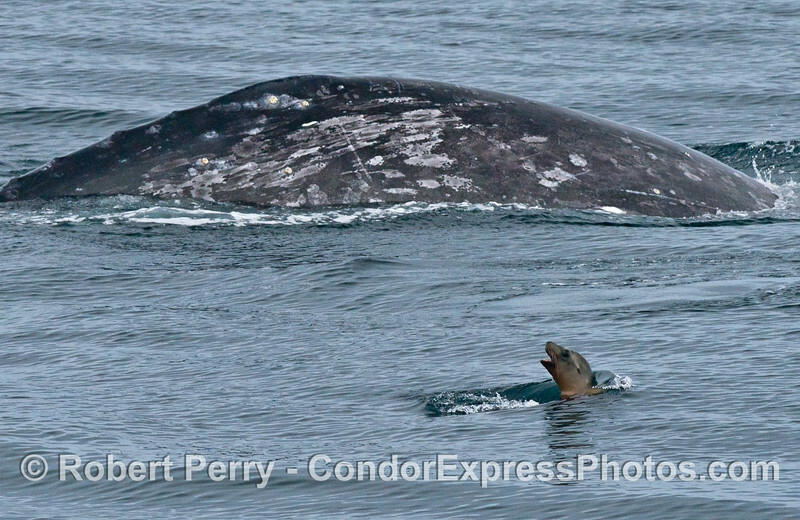 I know that several of my photos today will show gray whales fluking up and sea lions close by posing to be in the picture. 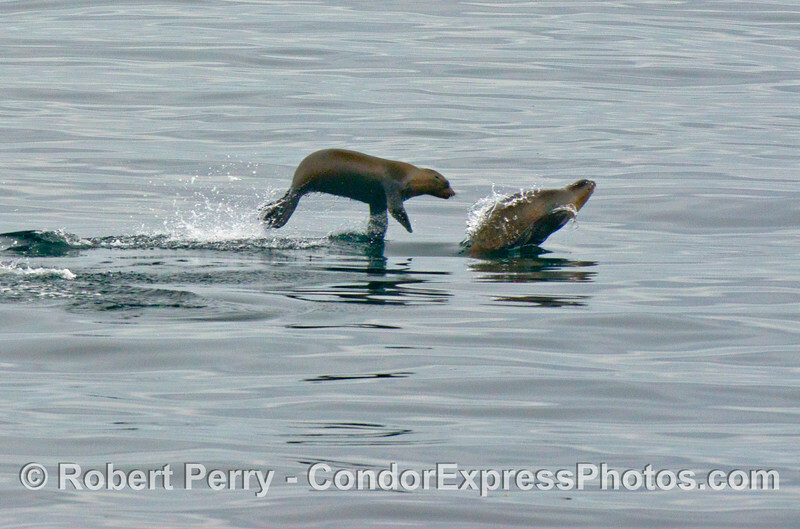 Hambones for sure as they leaped and did a variety of mid-air acrobatics…posturing to each other and the big gray beasts nearby. 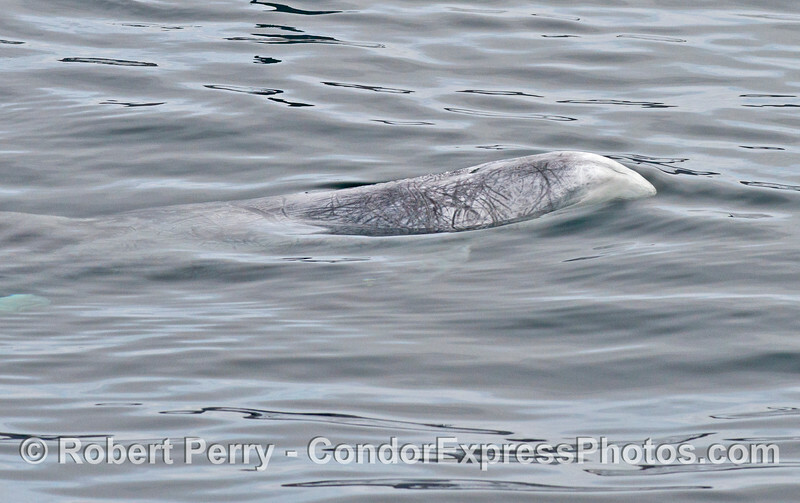 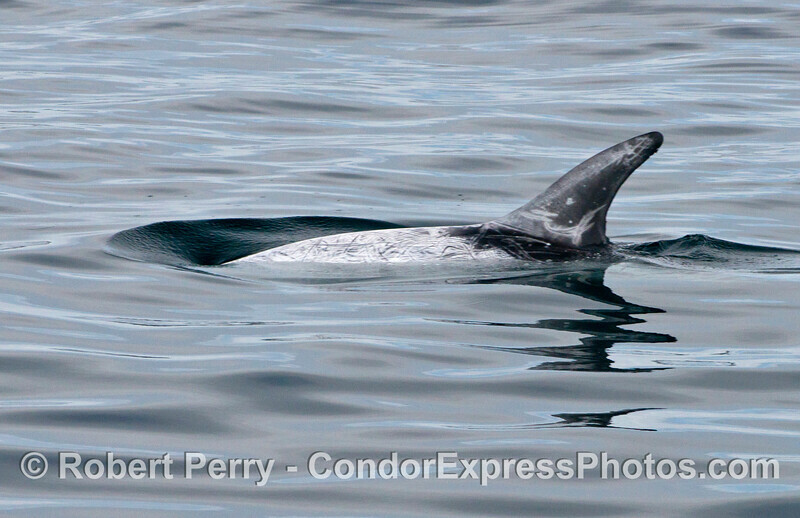 Also found along the face of the Island were two nice pods of big Risso’s dolphins. 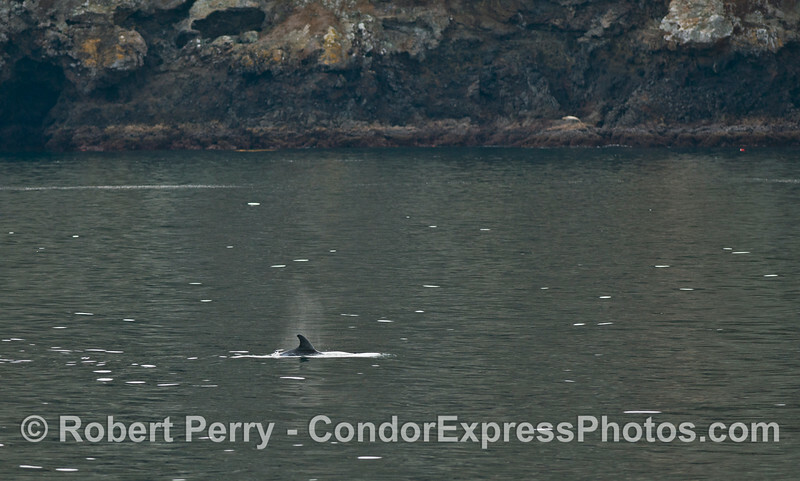 They were fun to watch in the grey and glassy water with their bodies visible shining bright blue-white below the surface. 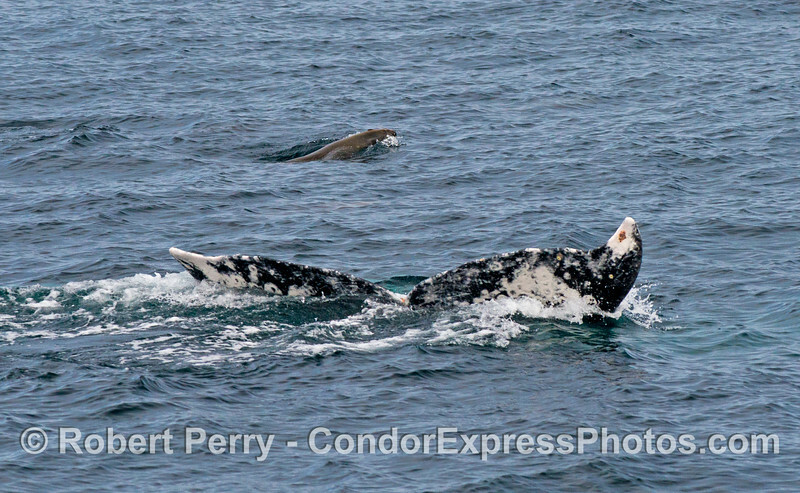 The whales and sea lions were heading east, and the Risso’s were heading west. 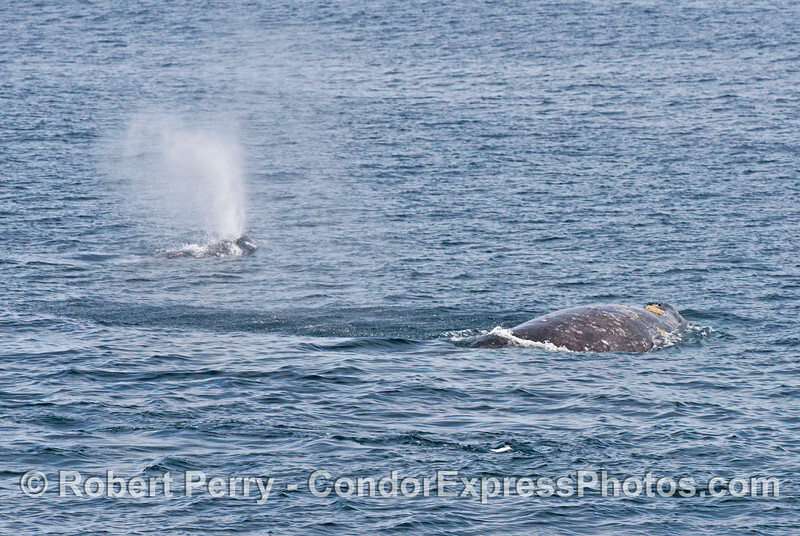 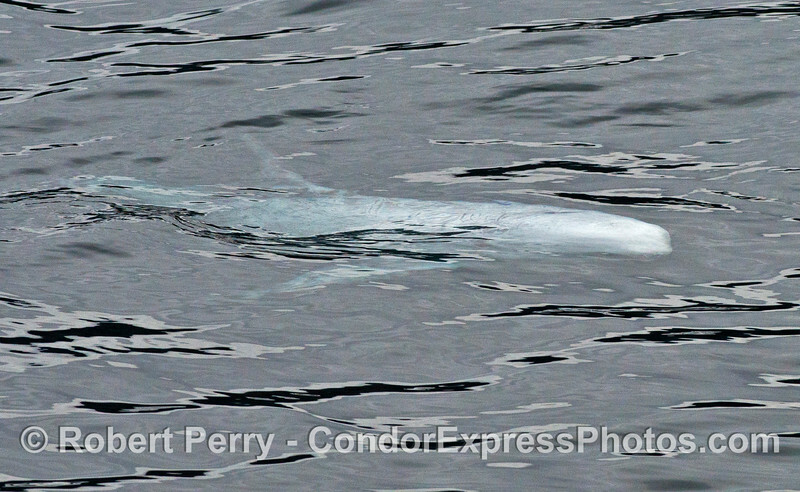 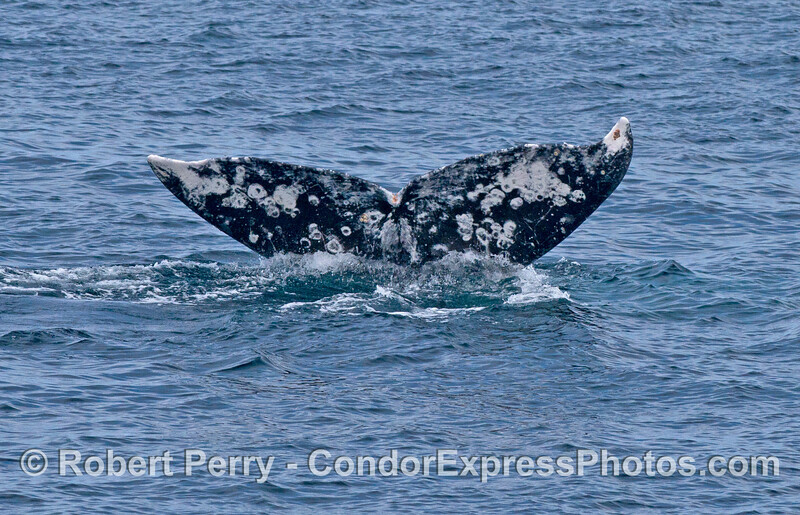 We did not see any Risso-gray whale hanky panky today. 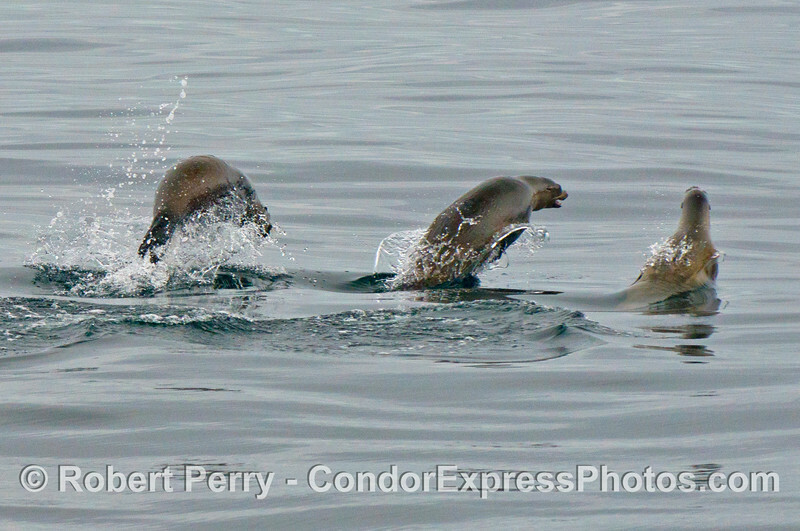 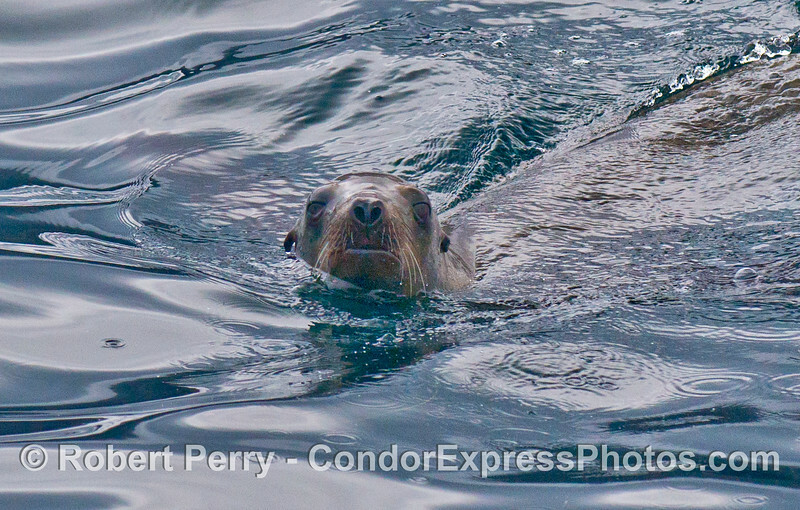 But no complaints were heard as the day was a magical blend of all five different species of marine mammals. 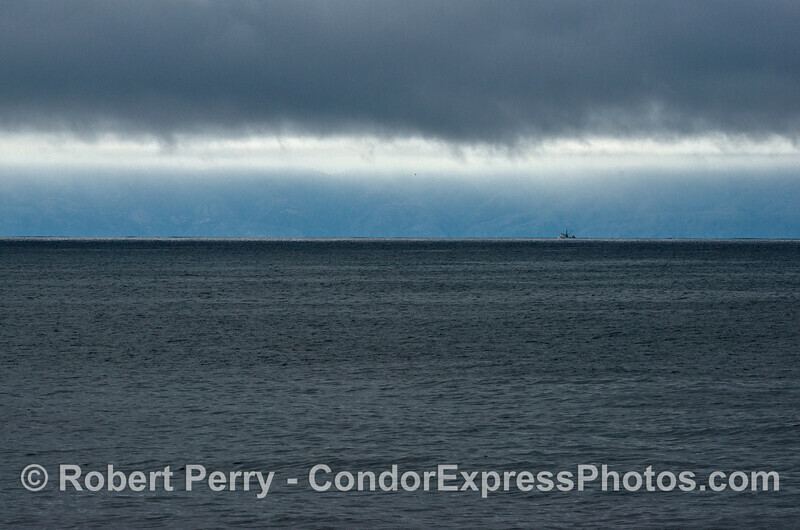 You can visit the map on the bottom of this page to see where we went.